Here's a wonderful idea for your child's next birthday present: you can pay to have an evil looking clown stalk your child. It is a service that is now available in Lucerne, Switzerland. --give your child a growing feeling that he/she is being watched and threatened. 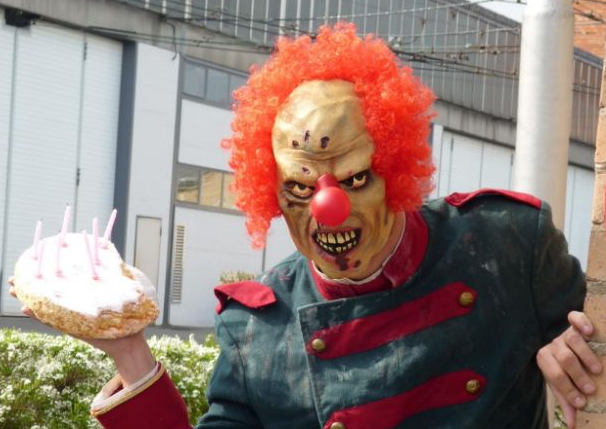 Then (and here is where the idea gets really good) after seven days of being stalked and scared, when the child least expects it, the clown will unexpectedly hit them in the face with their birthday cake. Once the festivities start, if the child becomes too scared or slips into a catatonic state, the parent can stop the "fun" with a simple phone call. I am just guessing that Dominic Deville, the founder of the Evil Clown service, has never actually been a parent. Either that, or he is a professional counselor who specializes in treating coulrophobia (fear of clowns) and wants to create future clients.